European Type Limestone Crusher consists of frame, eccentric shaft rotating part, crushing chamber, safety device and discharge adjusting device. Frame consists of side-panel, the front box assembly and rear box weldment. Eccentric shaft rotating part consists of movable jaw, eccentric shaft, bearing, bearing seat and belt pulley. It’s the main part to transmit power. 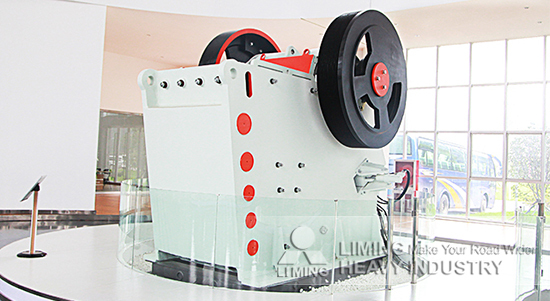 Crushing chamber consists of fixed jaw plate, moving jaw plate, side lining board and backplate. It’s working portion to crush materials. Safety device consists of toggle plate, toggle plate seat, spring and spring drawbar. It will take insurance effect when there is a exceptional case. Discharge adjusting device consists of adjusting fixed block, adjusting slide block, top screw bolt and slider locking drawbar. It can control the output size. <<Next：What is the price of mw series micro powder mill?